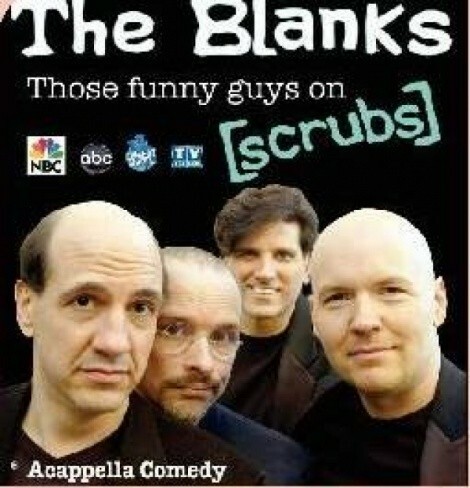 Perhaps better known as “Ted’s Band” from the ABC TV series Scrubs, The Blanks will perform material from the show as well as their new album as part of the Summer Nights with the Stars concert series in Layton. Before performing for eight years on the hit TV series, Sam Lloyd, Philip McNiven, George Miserlis and Paul Perry were just four friends who liked to sing a capella. Their show consists of singing, comedy routines, and renditions of T.V theme songs from classics like Charles in Charge, as well as a warped version of ventriloquism with toys. Watching The Blanks perform is like watching four boys play—action figures and all. Their new album Riding The Wave is a collection of songs performed on Scrubs, as well as contributions from the show’s cast and creator. Tickets are $20 for orchestra seats, $15 for reserved and $10 for general admission. Discounts are available for seniors and children.